There are several different ways to divide land; however the most common way is through a consent application. This is also referred to as "lot severance" or "land division". A consent application is made through the Committee of Adjustment; click here for more information on the consent application process. Land severance is the authorized separation of a piece of land to form a new lot or a new parcel of land. Amongst other things, in order to sever/divide a lot, each lot must comply with all of the Zoning by-law regulations. 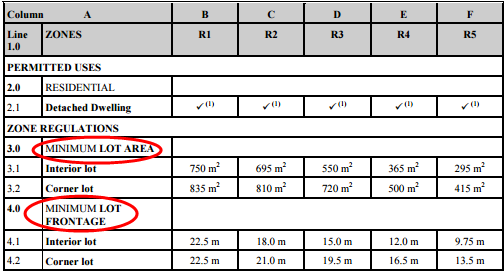 One of the main determining factors is compliance with the minimum lot area and minimum lot frontage. Any information contained herein is strictly for information purposes only and should be reviewed in conjunction with Zoning By-Law 0225-2007, as amended. In the case where the information provided conflicts with that of the text contained in Zoning By-law 0225-2007, as amended, the text shall prevail. It should not be relied on when making decisions in connection with real estate transactions, development proposals or building permits. Please visit the Mississauga Civic Centre, between 8:30 a.m. and 4:30 p.m. to review the Official Zoning By-law and to speak with staff before making important decisions. A list of amendments passed by Council but not yet incorporated into the office consolidation copy can be found on the Unconsolidated Zoning By-law Amendments document. Corporate Services Department, 2nd Floor.